Today I peeled back the plastic on Vittoria, the first eggplant to show up for the season. So far, seeded a week ago, there’s Dusky and Vittoria eggplant, and Ace, North Star and Gypsy peppers, and they’re all just beginning to poke up. 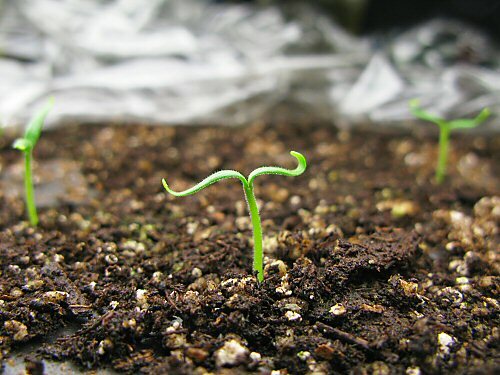 These seedlings are ahead, with a little more than a day’s growth. Peppers and eggplant tend to germinate unevenly, at least in my particular lighting set-up, usually appearing first in the rows directly under the lights, and then making their way to the outer edges of the trays. I’m not sure if it’s the slight differences in light, or in heat from the lamps, that a couple of inches make, but it seems pretty clear that it’s one or the other, or both. Sensitive little guys. There’s a spread of up to a week between first up and mostly germinated… Adding to the unevenness, some varieties come up faster than others. Sorry, but this is a critique. I wanted to get information on just two (2) related subjects as follows: Readington Farms Free Farmed (free ranged) Chicken, no hormones or other unwanted s. I know I can get them in my area, but Shop Rite does not yet deliver here. I’m in West Oak Lane. I found on the web what I think is the nearest store to me that delivers is the Aramingo Ave store. I think I have this part covered. Next, I wanted to know if one can purchase the chicken wholesale, i.e., several to a case or how ever. It seems like everything came up on the screen except what I typed in. This is very frustrating to say the least! ! ! I am very pleased to know that this product is available, but wow, getting it from point 1 to point 2 is like pullling hens teeth! ! (LOL) Perhaps part of the problem lies with Google. Thanks for reading this. PS: also only saw boneless thighs, which is alright but I would also be interested in whole chickens. Those peppers & eggplants can be pretty testy things. I germinate in a propagator that runs at about 30c, some have almost complete germination in as little as 4 days well others take two weeks. Enough to drive an impatient gardener crazy. I needed this post today! My peppers are taking an inordinate amount of time to poke through the soil this year. Or maybe I’m just less patient than last year? or maybe I have to quit checking them so many times a day? In any case, it’s nice to have a reminder that they are very slow and very sporadic. Thanks! Thanks for the reassuring post. I have been anxious about my eggplants and peppers seeds not germinating. Its been 7days since I sowed them. I use a 40W lamp and sun on the windowsill. The tomatoes have germinated, thats a very good sign for me. Onions seeds too have germinated. Hopefully in a few days the others will poke out too. Thanks for your posts. I started my eggplants (on the heat pad) in early February and some took FIVE weeks to germinate!!! Maybe they were not warm enough. Or maybe the seeds were too old. My eggplants just came up this past week too – planted first week in March or so. I guess they take time, thanks for the pic, makes me glad as mine look similar. When do they start to “solidify” a bit? Rosetta: Wow, that’s a pretty intense search you’ve got going! I hope you find the chicken you’re looking for. Sylvie: I’d have written ’em off long before five weeks, and reseeded. That’s a long time. You’re patient! I’m used to maybe a couple of week spread, and for me peppers that I end up waiting on.